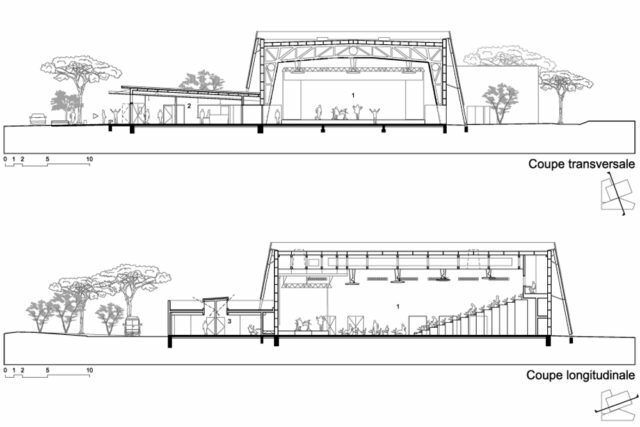 The ‘boiserie’, which translates as The Woodwork is a multi-function event center with a 1000-person capacity. 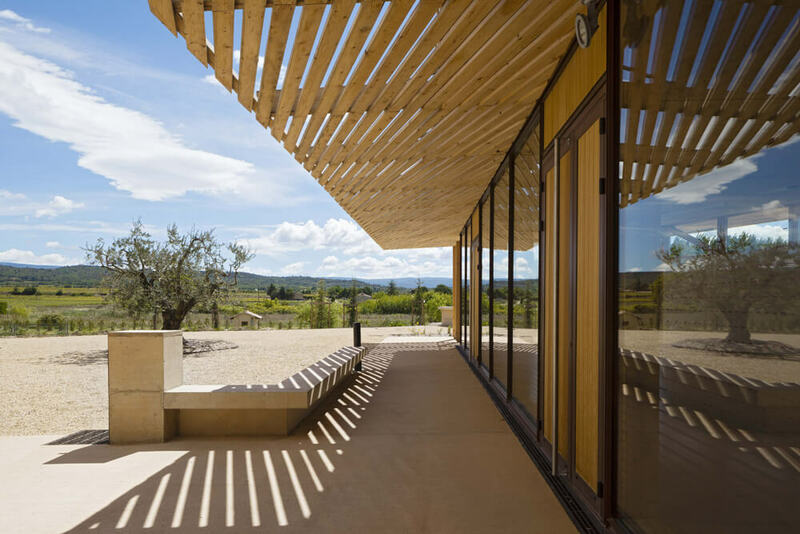 The building emerges from the striped viticultural landscape of Provence, France, and is dominated by the giant Mount Ventoux. 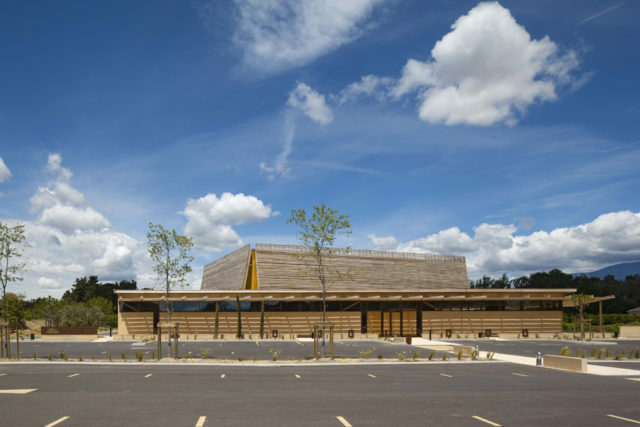 It is a unique example of timber and straw-bale construction. 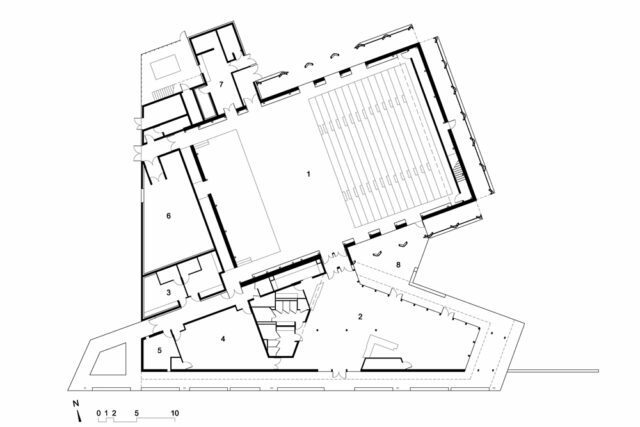 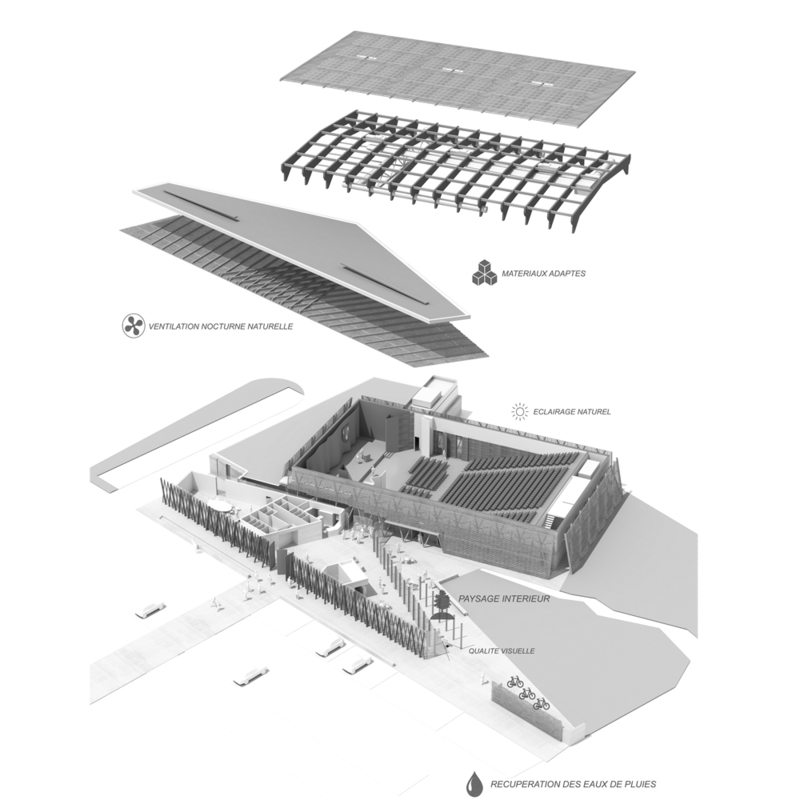 The program is split between two volumes to soften its impact on the surroundings and rupture its scale. 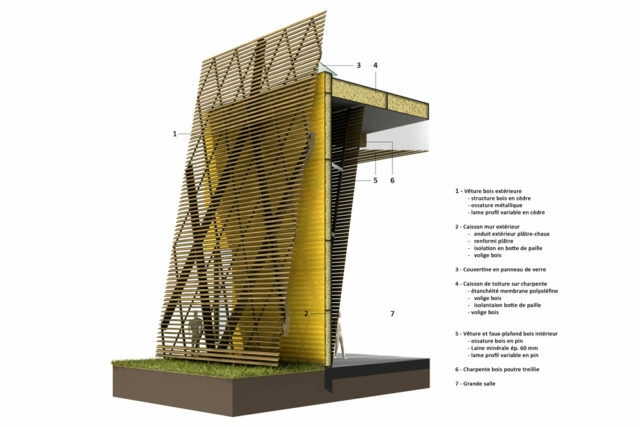 The Entry Pavilion is a low horizontal building inspired by the region’s dry-stone terraced retaining-walls called restanque in French. 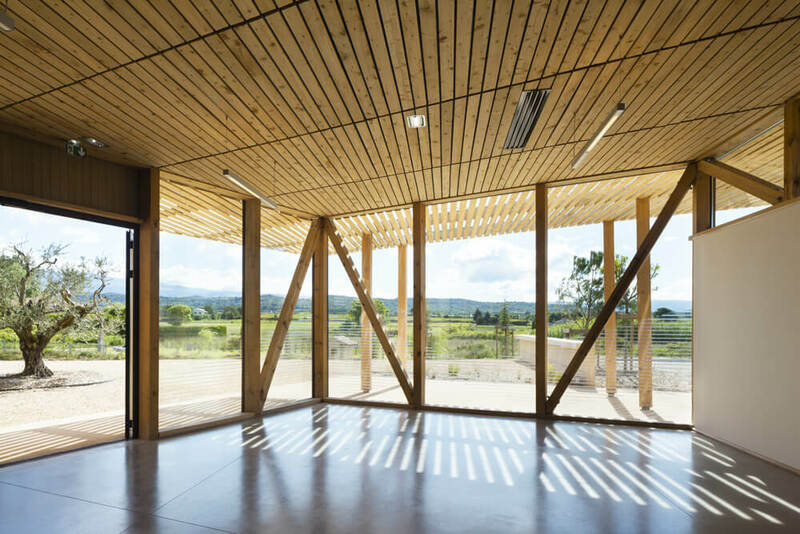 This pavilion opens out toward the landscape. 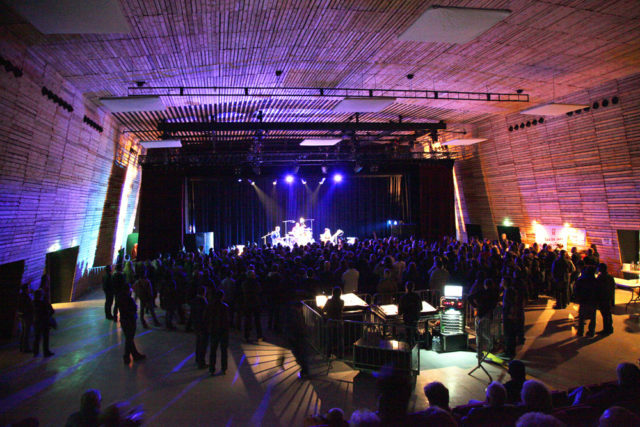 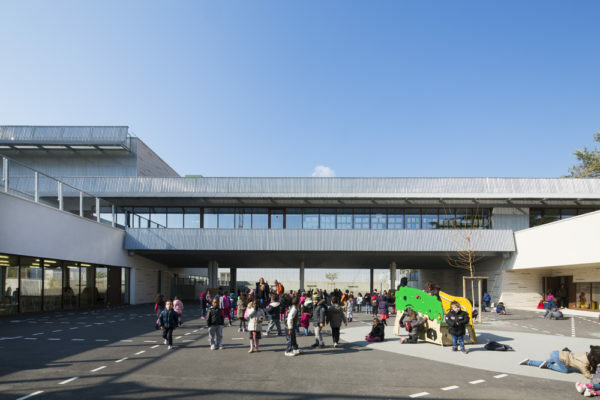 In the background, a 12-meter inclined cedar shading façade protects the plastered exterior walls of the concert hall. 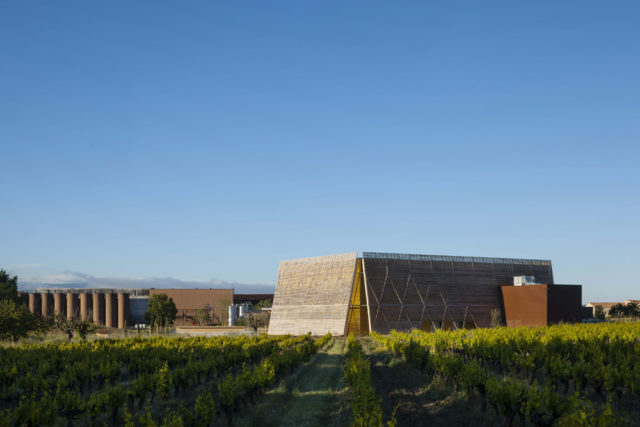 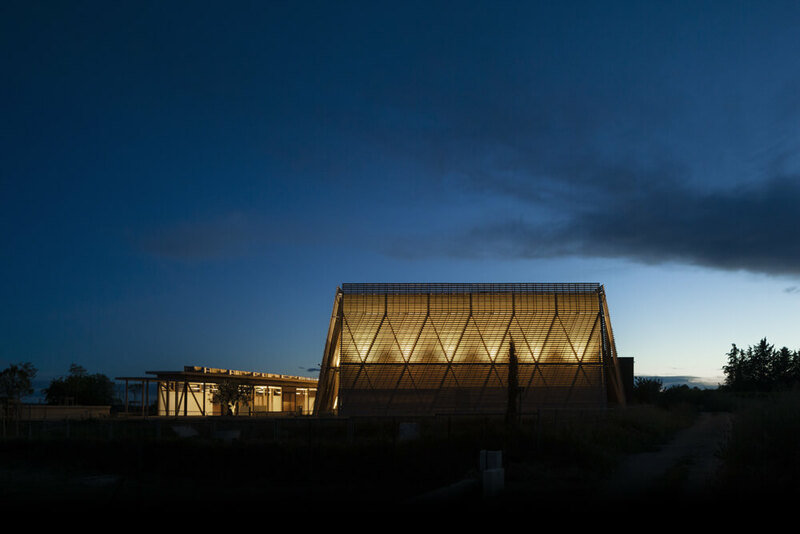 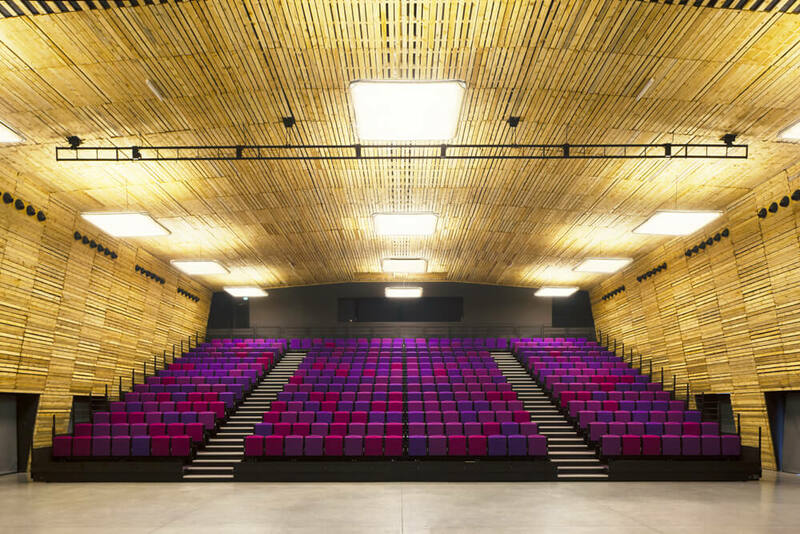 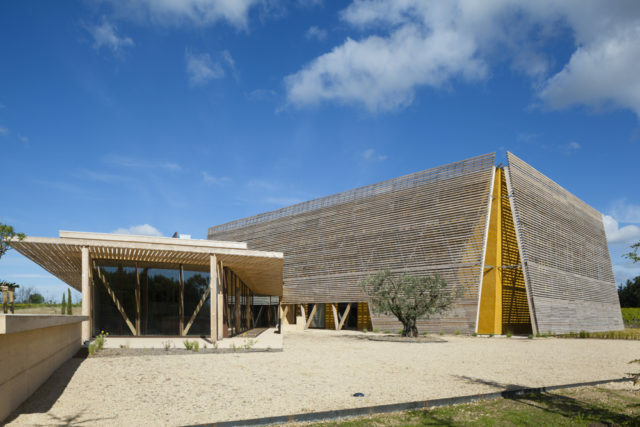 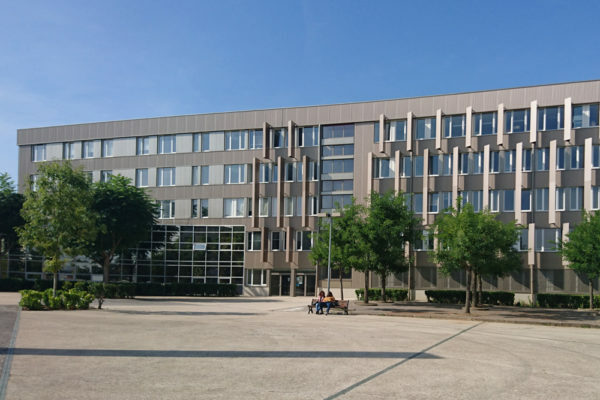 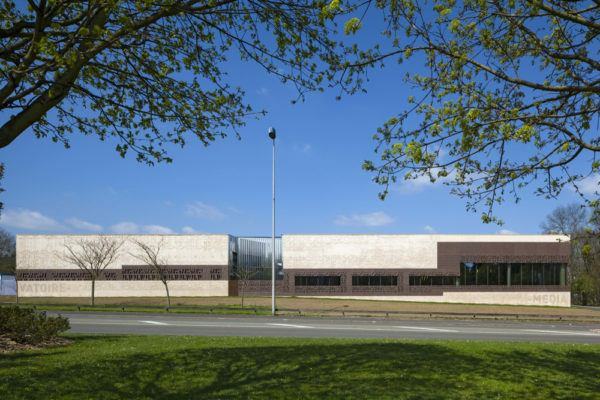 The angle of the timber skin references the slopes of Mount Ventoux and creates a silhouette that communicates the civic nature of the meeting hall. 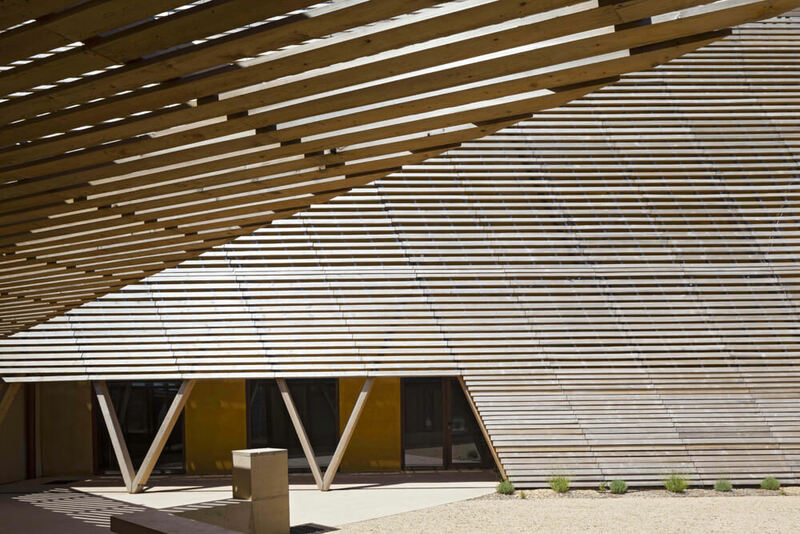 The sloping filter is made from slats of silver-grey cedar which project animated shadows onto the ochre-colored planes of the hall. 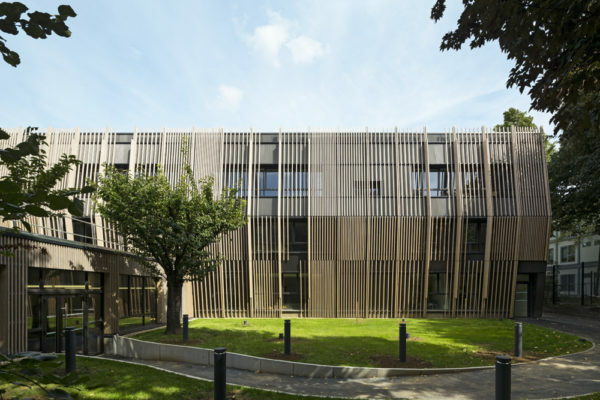 This double facade creates depth and a vibration of color and light. At night, the building is lit between the two skins, transforming it into a glowing lantern. The concert hall’s atypical interior mirrors the exterior with the timber slats on the walls and ceiling using the same rhythm. The exterior wood is essentially turned inside-out to re-express the majestic volume. 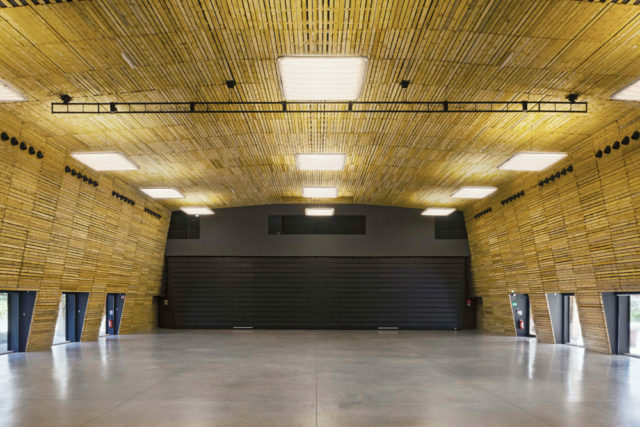 This timber ambiance evokes the traditional French community hall, and is ideal for a variety of possible configurations. The space is equipped with folding bleachers. It can be lit naturally or completely shaded from daylight. The use of wood and straw-bale insulation results in a versatile acoustic environment. 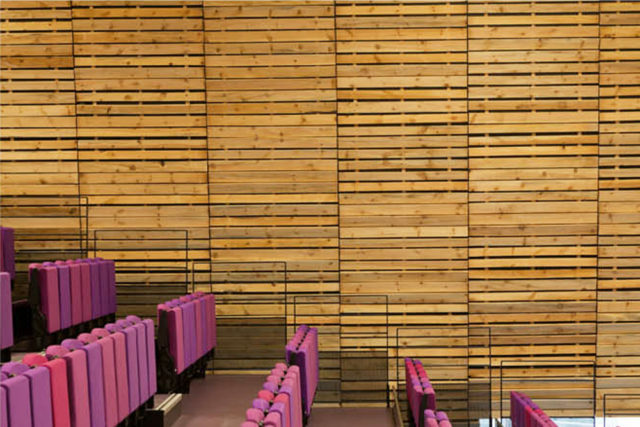 The space is infused by the smell of timber.